Sylvan Terrace, in Washington Heights, comprises twenty houses built in 1882 by architect Gilbert Robinson, Jr. 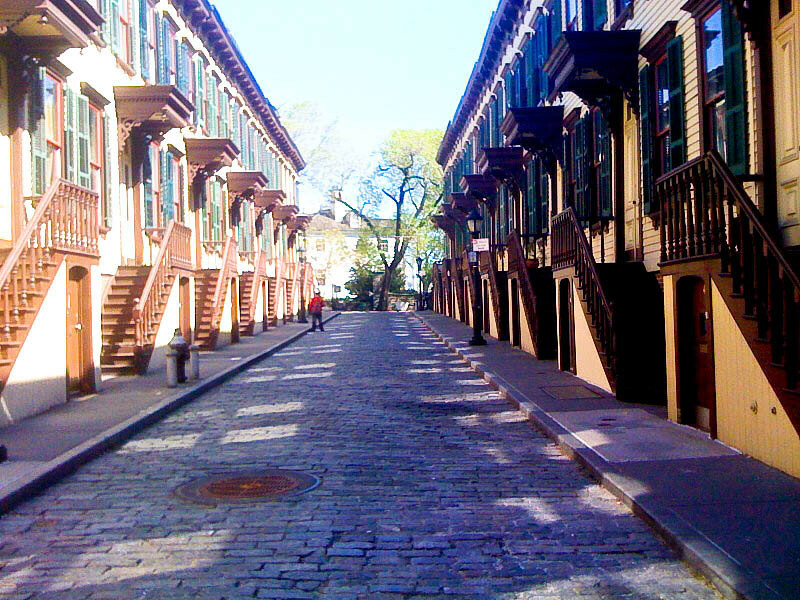 It is New York City’s largest extant unified grouping of wooden dwellings on both sides of the street to have been constructed after the Civil War. This charming street retraced the line of a former carriage drive of the Morris-Jumel Mansion (seen in the distance) to become a private thoroughfare. A million-dollar asking price for one of these houses is not unusual in today’s market, however few were originally owner-occupied. Their typical inhabitants were civil servants and laborers who were more likely to take in boarders than to hire servants. The streetscape is a designated New York City Landmark.